But this time, there was one dessert that I loved especially: a raspberry meringue roulade. I always thought I didn't like meringue. But it turns out I only don't like the meringue that is typically on top of lemon meringue pies; like the ones that are mostly soft sponge with just a little crisp on top. What I do love is the meringue in this roulade: crispy on the outside, mostly chewy on the inside, with just a little bit of sponginess. And along with the sweetness of meringue is the cool richness of whipped cream and these tart little bursts of raspberry. The crispy meringue melts in your mouth and the whole thing combines into this heavenly experience. You should definitely go make this right now! The first step is to whip up the meringue. 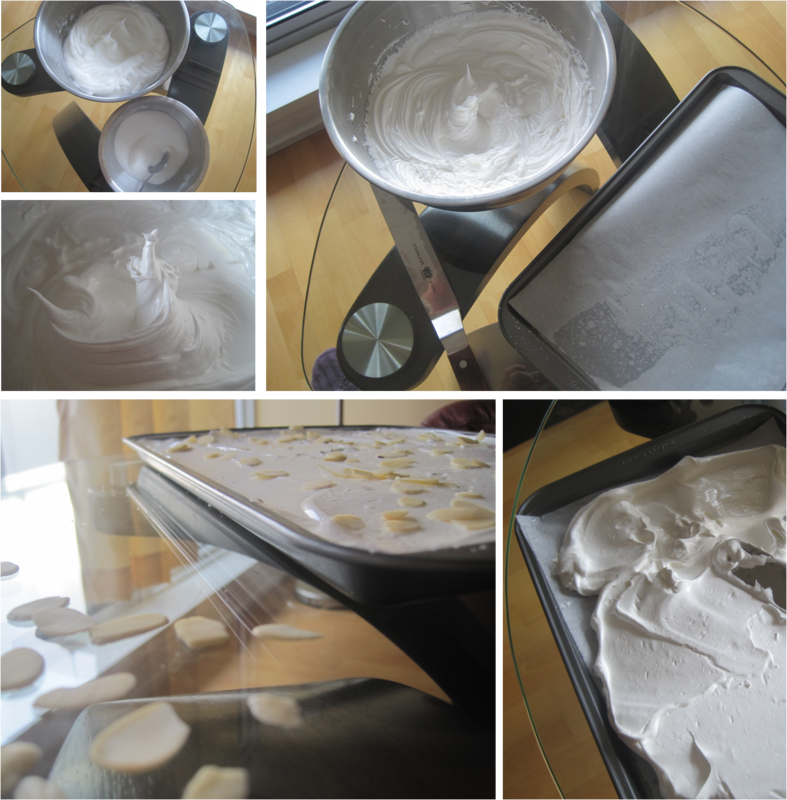 The meringue is then spread on a sheet pan, topped with slivered almonds, and then baked until just soft in the center. After baking, the meringue is turned out onto some parchment paper and let cool completely. 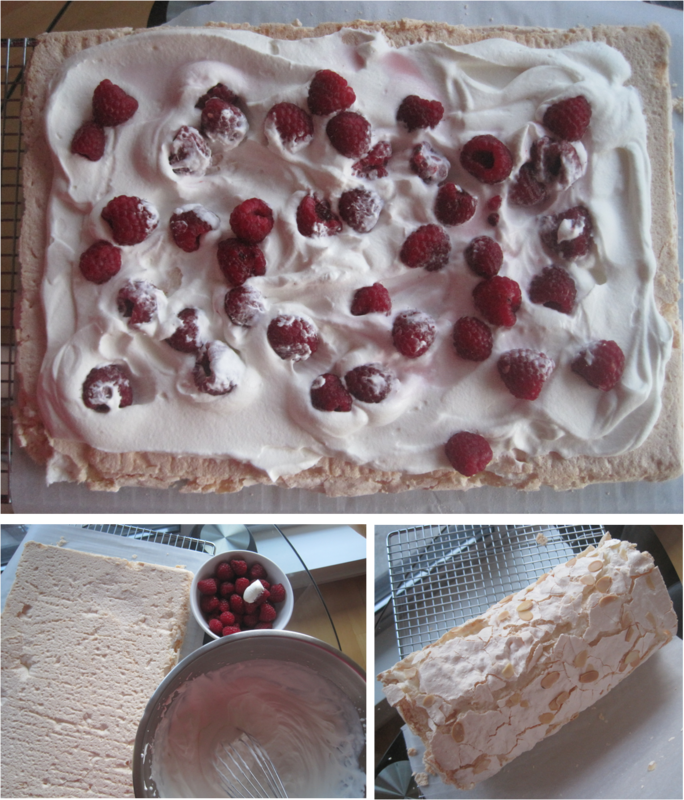 When it is cool, it is spread with soft whipped cream and fresh raspberries and rolled up. It might crumble quite a bit, but don't worry, use the parchment paper to help roll it up. Then refrigerate for an hour to help solidify the whole delicious beast. When ready to serve, slice into portions! The original recipe says you can eat it sprinkled with powdered sugar, or drizzled with raspberry sauce, so I thought I should tell you, but I think it tastes amazing just like this. Heat oven to 300F. Whip egg whites and lemon juice to stiff peaks. Combine sugar and cornstarch and slowly beat into egg whites until you get a nice stiff, glossy meringue. 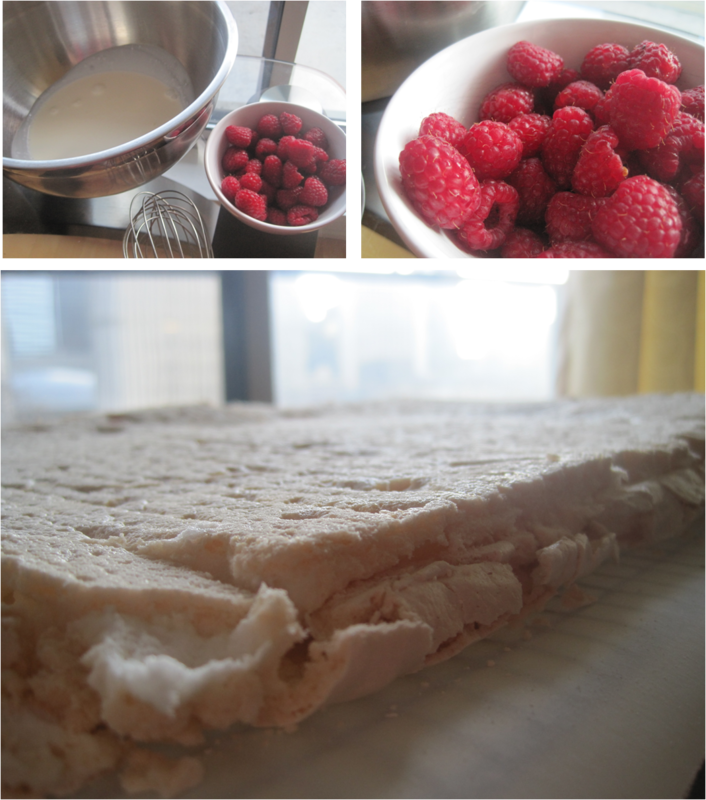 Spread meringue onto a 20x30cm sheet pan brushed with oil and lined with parchment paper. (Brush the sides of the pan with oil too... or else the meringue might not turn out of the pan too well... I don't speak from experience or anything...). Sprinkle with the slivered almonds. Bake at 300F for 45 minutes or until the almonds are toasted and the meringue is crispy on top with the center still a little soft. When baked, turn out onto a sheet of parchment on a cooling rack. Peel off the back parchment and let cool completely. Once cool, whip the cream and spread onto the meringue. Sprinkle with fresh raspberries. Starting at the narrow end, roll the meringue, using the parchment paper to help lift it. Meringue may crumble, don't worry, keep rolling. Refrigerate for at least one hour, then slice and serve, and please, enjoy every bite! Ooooo....so glad you posted the recipe and detailed instructions :) I definitely need to make this one! You would be better with an egg replacer!